Racing events require a lot of preparation, and undoubtedly a sturdy Racing Tent is a part of this. A Racing Tent must be sturdy and stable, but also have a finish that puts a certain sports brand in the spotlight and is easy to use. 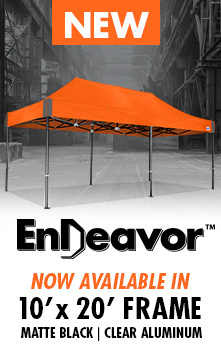 An E-Z UP Racing Tent is the fastest and most striking shelter for the racing industry. 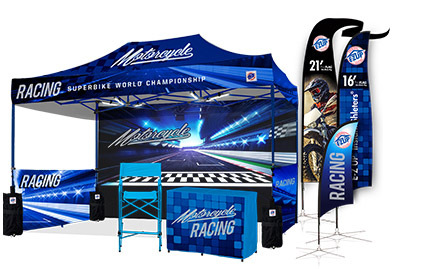 For moto racing, the Speed tents are the ideal solution due to their size of 2.5 × 3.5 metres. 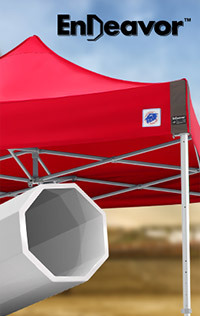 For auto sports on the other hand, the larger tents, such as the 6 × 3 or 3 × 4.5 (possibly linked with rain gutters and connectors) are often used. Sponsors who use tents for activation at the tracks mostly deploy the more compact 3 × 3 tents, printed in their colours, logos and slogans. "The E-Z UP® brand is synonymous with motorcycle racing and is as American as apple pie. We are delighted to welcome them as a partner to our sport and our Pro paddock, with their products protecting both our AFT team and competitors from rain and the glare of the sun." "The portable tents look pretty dynamic and impressive when the display is all put together. Our display is nice and clean with our logo branded on the tent sides, tops, and valance. It’s very impressive." "The shelters themselves are completely unmatched. They dominate anything else on the market." "Pits are looking sharp; the E-Z UP® Instant Shelters® rock!" How do you stand out among all the other participants in a race? By making your tent truly unique and having it printed with the logo of the team, or even photos of cars, engines or drivers. Or how about a sidewall showing all the logos of your sponsors? E-Z UP can assist with the design. Account managers and our graphics team are ready to help you with its creation. Several major brands, Formula 1 teams and Dakar winners have preceded you!